When I found out Stacks 3 was going to be bringing us new ways of doing things with our stacks, I thought it would be appropriate for Bricks to get an overhaul. So today I'm excited to announce Bricks 2, a totally re-written, faster, and easier to use masonry stack. 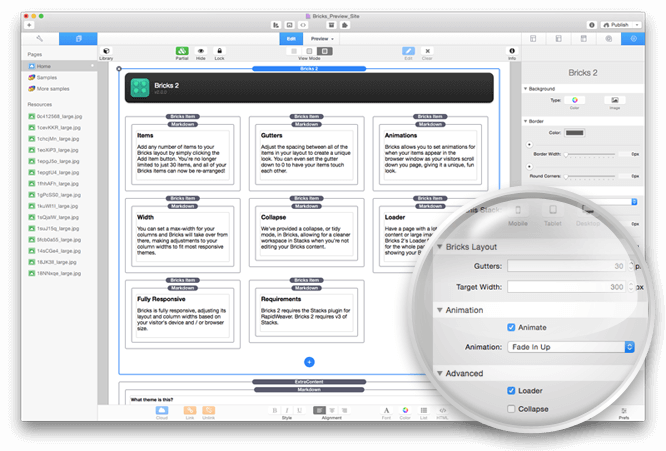 Bricks 2 benefits hugely from some of Stacks 3 newest features for developers. Bricks 2 doesn’t just get some nice new animations and a more lightweight footprint, it also gets the ability to add more Bricks items to your layout. Previously Bricks was limited to 30 items. With this update you’ll be able to add an unlimited number of Bricks items to your page. And there won’t be a price to pay in speed or functionality either. This stack is blazing fast now inside of Stacks. Another added benefit of Bricks 2 is that you can rearrange your Bricks items. Previously Bricks was locked into whatever layout you created, and re-ordering items within your layout was laborious. Not any longer though. Bricks 2 allows you drag and drop items, moving them around to create whatever layout you like. All in all Bricks 2 is a huge upgrade for the stack. It has been re-written from the ground up! Give Bricks 2 a look and checkout the overview video on the product page, as well as the live preview site. Bricks 2 is a paid upgrade. That being said — I’ve sent out a discount code to customers who own Bricks 1 already that will let you upgrade at a hugely discounted price!